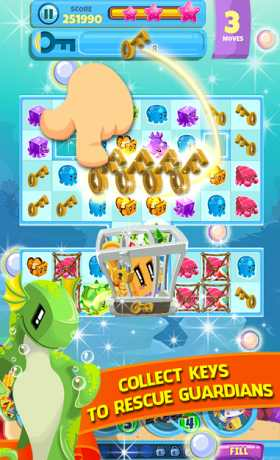 Get ready for a mesmerising under water experience in this exciting free-to-play match3 puzzle adventure! Beneath the deep blue ocean a vibrant and beautiful world called Oceania was thriving. It was well known for its ancient artifact, the source of all lifeforce — The Bubble Cube! One day a mysterious power came to steal it. One hero warrior remains! With the guidance of Professor Inkwright, you must venture through the different towns to free the other warriors. 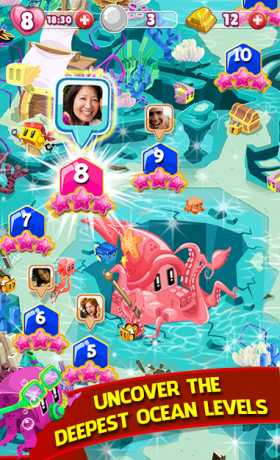 To take the Bubble Cube back and restore Oceania to it’s former glory, use help from the mighty Guardians, switch and match colorful finned friends, create FINtastic combos and earn precious treasures along the way! Dive in and take on this fantastic underwater adventure! ✮ NEW and unique gameplay of match-3 taken to the next level! ✮ 120 levels filled with challenging underwater puzzles! ✮ Vibrant underwater sceneries and melodious music! ✮ Collect amazing guardians, upgrade them, and discover their special powers! ✮ Connect to Facebook, compete against your friends, and achieve the highest score! 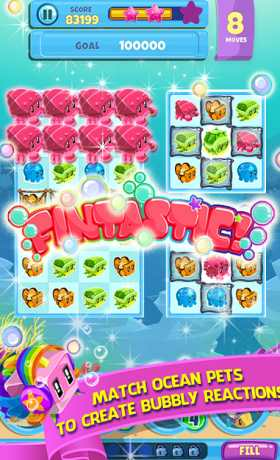 Bubble Cubes is the FINTASTIC underwater match 3 puzzle game for your Android device! Download the game from Google Play store & Play now!